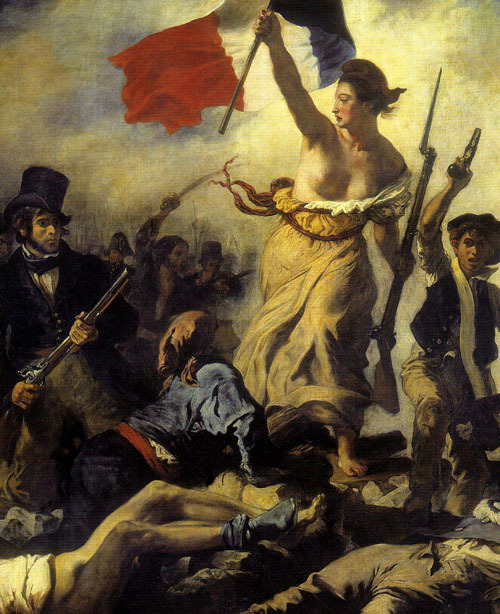 In Europe, the revolutionary transformation of the ruling systems and state structures began with a bang: In 1789 the French Revolution broke out in Paris, and its motto "Liberte, Egalite, Fraternite"�Liberty, Equality, Brotherhood�took on an irrepressible force. 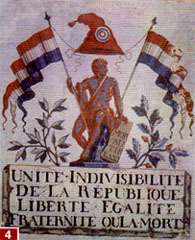 A fundamental reorganization of society followed the French Revolution. The ideas behind the revolution were manifest in Napoleon's Code Civil, which he imposed on many European nations. The 19th century also experienced a transformation of society from another source: The Industrial Revolution established within society a poorer working class that stood in opposition to the merchant and trading middle class. The nascent United States was shaken by an embittered civil war. The economic growth that set in following that war was accompanied by the development of imperialist endeavors and its rise to the status of a Great Power. contemporary painting by Eugene Delacroix. Criticism of authority and tradition on all levels grew with the rationalist and emancipatory ideas of the Enlightenment. laid the foundations for a new pan-European social order based on the principles of personal freedom and equality before the law. In the course of the 19th century, the middle class, often champions of liberalism, increasingly came to dominate public life. liberty, equality, brotherhood or death,"
Napoleon ended the French Revolution with his coronation as 6 emperor of France in 1804 and, through military conquest, set about reordering continental Europe according to his own vision. Although he was ultimately defeated at the Battle of Waterloo in 1815, and the other powers attempted to restore the pre-revolutionary conditions in the 1815 Congress of Vienna, Napoleonic rule left deep traces across Europe. The ideas spread by the revolution and the Napoleonic reforms that followed made a return to the old structures of rule impossible. With Napoleon's 1 civil code, the areas of Europe he conquered experienced a civic law that shaped the demands of later nationalist and liberal movements for constitutional protection of citizens' rights. 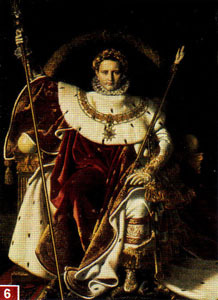 The tensions between the old ruling powers and bourgeois movements demanding a political voice eventually culminated in the European revolutions of 1848. The threat of civil disorder was initially successful in forcing through constitutional reform, but the movements lacked unity, and much was clawed back once order was restored. The 1848 revolutions nonetheless marked the entry of the middle class into the ranks of those seeking to preserve social order. 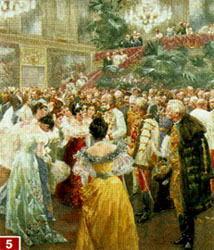 The middle classes tried to imitate the 5 lifestyle of the aristocracy. Bourgeois society and the workers would never again find themselves on the same side of the barricades. At the beginning of the 19th century, industrialization, which had already begun in Great Britain in the 18th century, gathered pace in many parts of the European continent with inventions such as the 2 steam engine. The implementation of new technologies created a rapid transformation of working and living conditions, often initially for the worse. With the emergence of a growing pool of undifferentiated "wage labor," a new stratum�the working class�was formed. The industrial workers lived in workers' quarters in the expanding cities marked by squalid conditions. As economic conditions in the countryside continued to deteriorate, rural workers lost their livelihood and moved into the cities to seek work. Many people also emigrated, particularly to America. They fled from 3 poverty and the increasingly authoritarian backlash that followed the 1848 revolutions. The emerging industrial labor force was often politicized and organized. The demands of the workers were often related to wages and hours, but in many places they also joined movements with demands including universal male suffrage and the relief of poverty. More systematic political ideologies, notably anarchism and socialism as expounded in the popular Communist Manifesto by 7 Karl Marx and Fricdrich Engels, vied for influence among the urban working class. By contrast, although many radical leaders had bourgeois origins, the middle class as a whole became increasingly conservative, identifying its interests with the preservation of property rights. The expanding economies of the 8 Industrial Revolution demanded access to new sources of raw materials and markets outside Europe. At the same time, the flood of labor to the cities and the lack of regulation contributed to appalling urban working and living conditions. In addition to the Industrial Revolution, increasing nationalism�in the form of imperialism�became a major source of great power engagements outside Europe, especially in the later decades of the century. This made a decisive contribution to the outbreak of World War I. In the second half of the 19th century, nations increasingly linked their emerging identities with competition for world power. As well as bringing power and prestige to a nation, colonies were a source of valuable raw materials, markets for industrial goods and, in some cases, strategically vital naval bases. Influence in the world meant economic power. Furthermore, imperialism was underpinned by the presumptions of 19th century social science, which lent intellectual cover to imperialist ventures. At its simplest imperialism was perceived, or at least presented, in paternalistic terms. The self-image of British imperialism, for example, was that of the world's greatest empire nurturing the development of subject peoples around the globe until such time as they would be ready to govern themselves�although of course only Britain would be able to determine when this might be. Once Tunisia had been occupied by France, and Egypt by Great Britain, at the beginning of the 1880s, the contest between the European powers for territories began. The United States, which made its own colonial acquisitions in the Pacific, accelerated US hegemony in Central and South America with the 1823 Monroe Doctrine. The Great Powers also included the new Italian state and the German empire. The overlapping of interests, particularly in what became known as the "scramble for Africa," led to open conflict. At the Berlin Congo conference of 1884, an agreement was reached as to the spheres of interest of the Great Powers in Africa, considerably reducing the costs of imperialism to the point where a carving-up became viable. 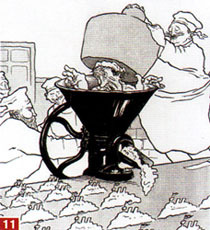 However the European powers also followed an alliance policy that anticipated the fault lines and fronts of World War I. The first military conflict of the Great Powers after the Vienna Congress was the Crimean War of 1853-1856. Great Britain and France fought on the side of the Ottoman Empire against Russia in the Black Sea region. 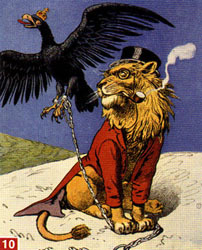 This strained relations between Austria and Russia, as the weak Austro-Hungarian Empire sought to remain neutral despite its alliance with Moscow. The expansionist drives of the Great Powers inevitably created conflicts. Great Britain and France had overlapping claims in Asia and Africa that threatened to turn into a major war. However, neither side could afford such a course, and the Entente Cordiale (French: "friendly understanding") of 1904 secured an alliance between Great Britain and France. 10 Imperial Germany then sought to catch up with Britain and France by acquiring its own colonial empire, and this competition led to an 11 arms race. By the beginning of the 9 First World War in 1914 the major powers were thus entangled in a complex web of alliances and a growing competition for colonial empire. "In the kitchen of the fleet chef"